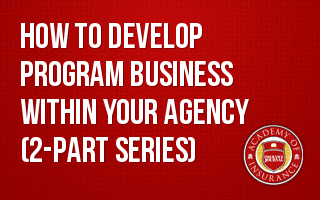 One of the best ways to grow your agency is by entering into a "Program" business model. Learn the three major steps required to build a successful program business model. This 2-part series is broken down to two, 1 1/2-hour sessions which may be viewed at your convenience. Do you want to grow your book of business? Who doesn't; and one of the best ways to grow your agency is by developing and entering into a "Program" business model. But do you know where and how to begin? The Insurance Journal Academy of Insurance offers you a blueprint to guide you through building a successful program. Mary M. Eisenhart, CPCU, ARM, ARe, RPLU, CIC, CPIW, shares her expertise in producing, underwriting and managing program business exclusively with you. Each of the three major steps required to build a successful and sustainable program business model are detailed over 2 classes. Before you can launch a program, you must determine the viability of the program. This class identifies everything you may need to consider to thoroughly research your program opportunities, including expertise development, competition, target client buying habits, territory, approaching carriers, exclusivity, MGA possibilities and technological concerns. The session covers the many projections you will need to make to develop the optimal financial and operational management of any program. Once you have thoroughly researched the program, you turn it into a reality. We begin the development stage in this class, including approaching carriers and non-disclosure agreements (NDAs). Whether you choose a retail, wholesale or combined business model, you will learn a detailed approach for developing the sales and operational side of your program. This final part continues the discussion on development of a program business model, and provides insights into staffing, recruitment and training, sales and marketing plans, underwriting guidelines, internal procedures, applications, and more. After you have researched and developed your program, how do you get it out to the market? This final segment also details how to roll out your program. Discussions revolve around sales scenarios, further development and coordination of sales and marketing plans and association involvement. Measurement of results is a key component – you have to think like both an agent and a carrier – and we show you how to take a "production underwriting" approach to making your program a success. Creative approaches for high retention and prolonging program life are discussed, as well as methods for staying ahead of your competition.